Patna (Bihar), May 19, 2018 (TMC Desk) Several civil organisations gathered today on Saturday at Patna to discuss plans to combat danger hovering over the constitution of India by the current central government. The discussion was organised jointly by Unorganised Sectors Workers Organisation (Asangathit Kshetr Kaamgaar Sangathan), Ambedkar Students Forum, Bihar Domestic Workers Union, Bihar Women Society, Bihar Women’s Network, Right to Food Campaign, Bihar Sarvodaya Mandal, CACL, Dalit Adhikar Manch, Ekta Parishad, Gandhi Smark Nidhi, Rahstra Sewa Dal, IPTA, Public Health Campaign, Lok Parishad, Lok Sangharsh Samiti, Lok Manch, NAPM and many more. 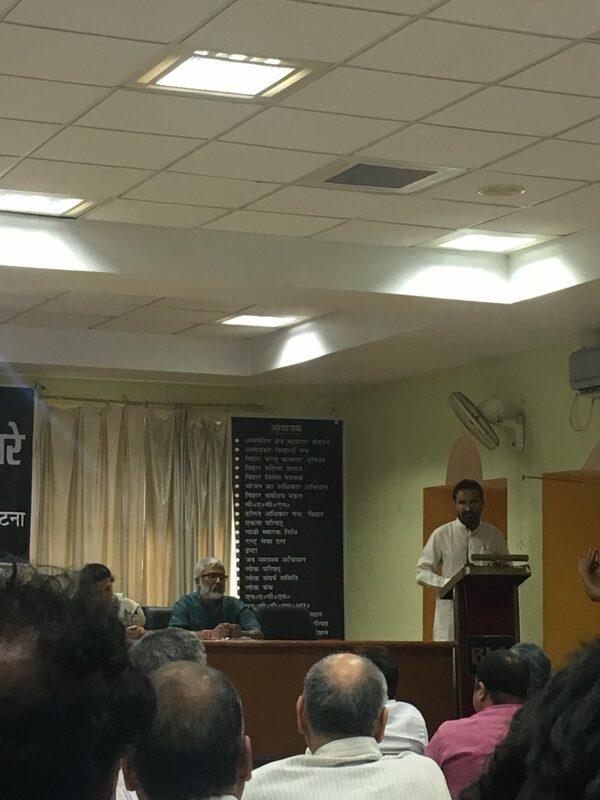 Representatives of many civil societies working in unorganised sectors, political parties like RJD, Congress, Communist Parties, NGOs spoke about continued attacks on constitution and constitutional bodies by the RSS and its political wing BJP. “It is high time to forget differences and unite on common ideology and philosophies,” noted civil rights activist Shabnam Hashmi said. “My brother Safdar Hashmi was killed by Congress goons and I have many differences with Congress yet I am with Congress on a shared philosophy of India. I have been protesting against Congress policies since my life but danger today is far more severe than that of the past. Therefore, I urge you to forget the differences and fight for a greater cause.” She said. 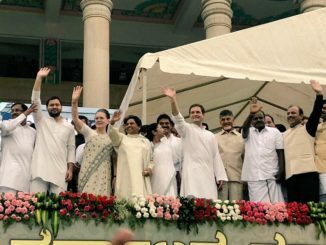 “Civil societies, opposition leaders and all of us should understand if the BJP comes to power in 2019, no one will be spared. India is inching towards China and it is inevitable that our all constitutional rights get seized,” she added. “One year is very crucial and the BJP and the RSS may instigate violence all across India to polarise the mass and we may be distracted. However, we need not indulge ourselves in firefighting and work towards our goal 2019 to save constitution and India,” social activist said. She also said that we need a campaign “Back to Ballot” to run. If not, at least we should ensure 60% VVPAT be checked. Kaukab Quadri, acting president of Bihar Congress said that our constitution is unique in the world where every citizen irrespective of caste, creed and religion has equal rights to live in this country. It must be protected. 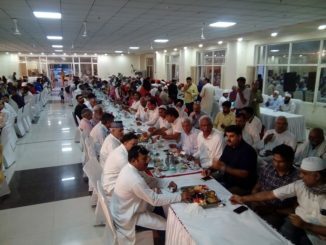 Bihar Congress Incharge, Shakti Singh Gohil also participated in discussion. He said that today people at top are a rotten lot and setting wrong standards for people to follow. “Our young minds are being polluted in RSS shakhas and schools run by the organisations. Those being taught and trained in the centres run by the RSS and those who are being educated elsewhere can easily be distinguished.” He said. 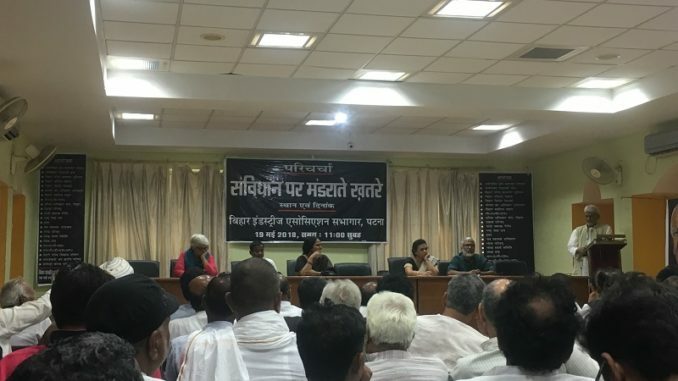 Shwetabh Pankaj, ActionAid, Nivedita Jha, CPI Leader Ram Babu, KapileshwarRam, Dalit Adhikar Manch, Raja Ram Singh, CPI (ML), Anil Kumar Roy, RJD Leader Alok Mehta, RAmanuj, Anand Madhav, Daisy Narayna also spoke on the occasion. Rupesh, convenor of Right to Food anchored the discussion. Noted social activist Arshad Ajmal presided the discussion. He urged all non BJP political parties to leave room for others to accommodate in coalition and show their generosity. Kishanganj MLA, Dr. Mohammad Javed Ahmad, JD (U) Leader Shyam Rajak, Naqeeb Ekta, Secretary, Youth Congress Bihar were present among many others. 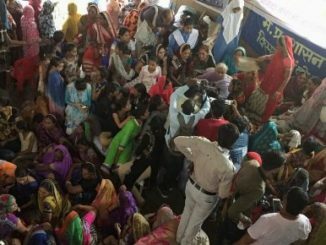 Hall was jam packed and ended with a happy note: BJP government failed floor test.